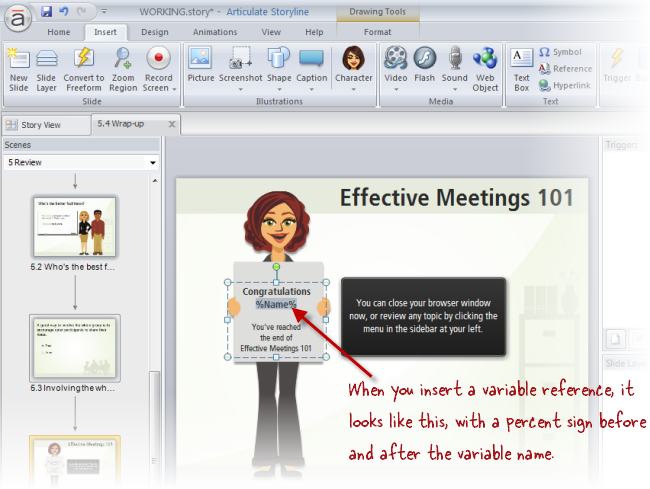 The Variables feature in Storyline enables you to collect and store pieces of data that you can refer to later. One of the ways you can use variables is by displaying the value of the variable to your learners. For example, let's say you've inserted a text variable at the beginning your course to collect a bit of text from the learner, such as their first name. Later in the course, you can insert a reference for that variable—which is really just a placeholder that tells Storyline to display the variable's value on the slide. Draw a text box on a slide, or place your cursor in some existing text. Click the Insert tab on the Storyline ribbon. 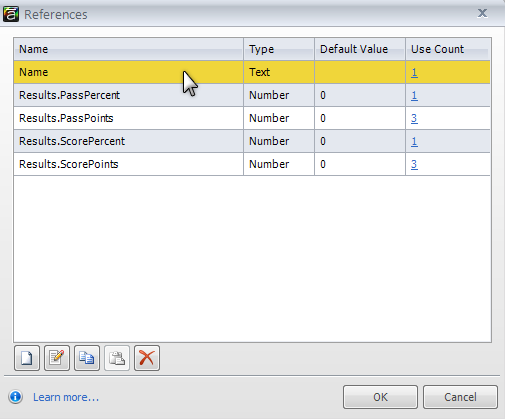 The References window appears, showing a list of any variables you've inserted into your course. Select the variable you want to reference, and click OK. In the following example, I'm choosing to insert the value of the variable called "Name." When you insert a variable reference, a code appears in your text as a placeholder. It consists of the variable name, with a % sign before and after it, like the example below. When you publish your course and your learners interact with your content, the value of the learner-entered variable will appear within your text when learners arrive at the slide that contains the reference. 3 Paths in 1 Quiz: Possible? Yes!